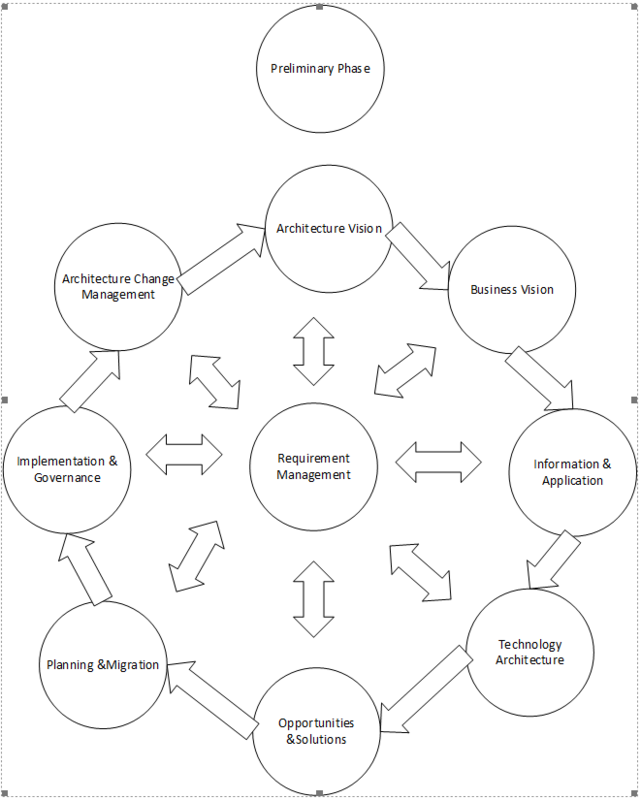 Please read my previous blog on ADM part 1 here https://blogs.sap.com/2016/10/18/role-architecture-development-method-adm-sap-projects-part-1/ before reading below blog. Before getting into each phase of ADM cycle. I need to explain Preliminary Phase and Requirement Management Phase which are key phases in ADM. Preliminary Phase: This phase is used to pitch the project at very high level. In this phase, the discussions are conducted on some of the key topics of the project as listed below. This phase will allow to consolidate and segregate information which will allow management to make a decision to proceed forward to initialize and accomplish the project. Requirement Management Phase: This is a key phase in ADM as it will drive the entire cycle and also allows to make necessary changes to BDAT phase if required. If you see the schematic representation of the ADM diagram this phase is in the center and also it is bi-directional which means it is iterative and helps to make necessary changes during development of target architecture. Phase A: This is called Architecture Vision phase in which we will analyze the baseline architecture to develop target architecture. After developing the target architecture a gap analysis will be performed to understand the difference between former and later. This allows architects to design more accurate target architecture for the landscape. Phase B: This is called Business Architecture phase, As I have discussed the 4 components “BDAT”which is key in any organization running a business. In this phase, the analysis is done to understand baseline business architecture so that an effective development of the target architecture can be accomplished. This will allow the team to perform a gap analysis to understand what new businesses are added by stakeholders and how it needs to be handled in the landscape. This is one of the key phases as it will drive other 3 components in an enterprise landscape. Phase C: This is called Information and Application architecture phase. This is the “D” component of BDAT. In this phase baseline, data and application architectures are analyzed to develop target architectures and perform gap analysis which will allow understanding what are the new business data transaction added and what new applications or interfaces needs to be developed to handle the data. It can be understood easily from SAP project perspective, Say business organizations are adding new businesses in the landscape like Ariba and Sales Force. Now it is important to understand the new data structure so that interfaces can be developed to accommodate these business transactions if the landscape is already using any process integration tool. Phase D: This is called Technology Architecture phase. This is “T” component of BDAT. In this phase, baseline technology architecture is analyzed to develop target technology architecture and performing gap analysis which will allow understanding new technologies needed to be implemented in the landscape which will support new application development.This phase also consists of both hardware and software part of technology. Phase E: This is called Opportunities and Solutions phase. In this phase,any new additions and scope changes can be made which in turn will make changes to BDAT phases of the ADM cycle. This phase will provide an opportunity for stakeholders to incorporate new changes so that it will allow architecture team to efficiently design target architecture before going to downstream phases in which making changes are not recommended. Phase H: This is called Planning and Migration phase. In this phase, the target architecture is reviewed and planning is done accordingly. In this phase, some of the key components listed below are finalized. Phase G: This is called Implementation and Governance phase. In this phase all the target architecture developed in the ADM cycle is realized. All the development work is started and architecture is implemented which needs to meet the target architecture which was developed using ADM cycle. In this phase, no room for error is allowed and Architecture team is responsible for meeting the design which was created to incorporate new business processes. Phase H: This is called Architecture Change Management phase. In a project, this phase is not used immediately unless there is a good business justification as it would involve a complete cycle of ADM. The reason this phase is not recommended because the target architecture which was developed and implemented needs to live for a while so that organization will benefit from the value adds which was proposed before moving to phase H.
Above mentioned are some of key features and uses of implementing ADM on a SAP project.This allows a project to be more transparent and helps to develop a robust and effective architecture for the landscape. very strange ..i found this article here also .. They have copied my blog! !